If the Corp installs a piece of ice protecting a central server, can they use Asa Group to install an upgrade in the root of that central server? No. Upgrades are installed in the roots of central servers, not in the central servers themselves. There's two themes for Sovereign Sight. TIME BOMBS! Assets that aren't threatening as soon as they're rezzed, but they will have bad consequences for the runner if they're not trashed by the next turn (or so). Sovereign Sight includes four: Gene Splicer, Echo Chamber Urban Renewal, and (possibly) Reconstruction Contract. 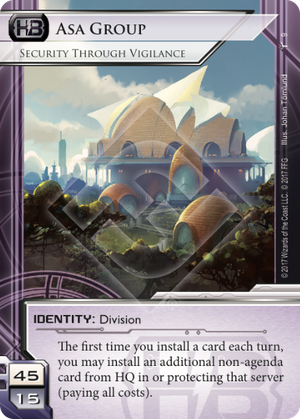 There are, of course, numerous other examples in Netrunner (Ronin comes to mind) but to have FOUR in one set seems to be pointing to a theme. None of these are Haas-Bioroid. However... Asa Group: Security Through Vigilance allows you to both install a time bomb, and protect it with ice in the same action, allowing you to install and protect two time bombs in the same turn, each in its own server. This means that, until your time bombs go off, you have a pretty good idea of what the runner is going to do. Do whatever it takes to defuse them. Which means you have a pretty good idea of what they're going to do for the next few turns. Let one or more of the bombs go off. Which means points. Or damage. Or both. Either way, you MESS WITH THEIR MIND!! !